Ultraseal has established a new global centre of excellence in Coventry at their Lyons Park site. The company exports to automotive OEMs and suppliers in more than 38 countries worldwide and has long been at the forefront of developments in its field of providing solutions to porosity – microscopic holes – in castings. It has made a significant investment in the new 42,000 square foot purpose-built facility in Lyons Park which lies on land that was formerly part of one of the motor city’s most iconic sites, Jaguar’s Browns Lane plant. Lyons Park is named after Sir William Lyons, the man who founded Jaguar Cars and developed it into one of the world’s most celebrated and coveted brands. 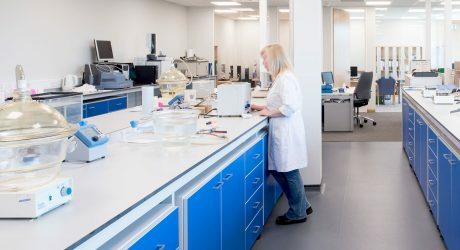 The centre of excellence provides Ultraseal with a new world-class laboratory which is twice as large as its previous one, allowing it to further expand its Research & Development, alongside modern manufacturing facilities and offices. Ultraseal’s parent company, Norman Hay plc, which is celebrating its 70th anniversary this year, and sister company Norman Hay Engineering have also moved with Ultraseal into the new building. Their previous joint headquarters in Godiva Place, Coventry, was close to the city centre. Gary Lloyd, Managing Director, Ultraseal International, said: “We are proud to have our new headquarters in Lyons Park, a site that has long been associated with Coventry’s automotive heritage and exporting achievements. “Godiva Place has served us well but our new centre of excellence gives us room to grow and provides more efficient manufacturing space. The new laboratory is world-class. “This allows us to advance the Research & Development which has been at the heart of our success for decades and demonstrates our commitment to a culture of continuous innovation and excellence. Ultraseal International is a pioneer in the field of designing and manufacturing casting impregnation equipment and porosity sealants that together provide a reliable and permanent solution to the problem of porosity in cast metal parts. Porosity is a natural phenomenon that occurs during the casting process itself: it comprises microscopic holes within the metal that can cause a part to leak, a serious defect for parts such as engine blocks, compressors and a host of powertrain components.